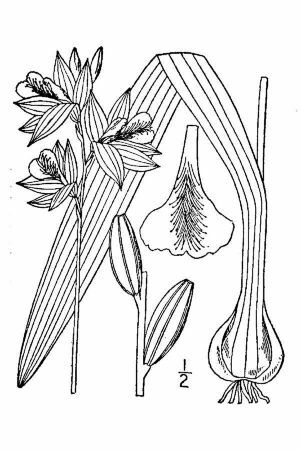 Synonomy: Calopogon pulchellus R. Br. ex Ait. 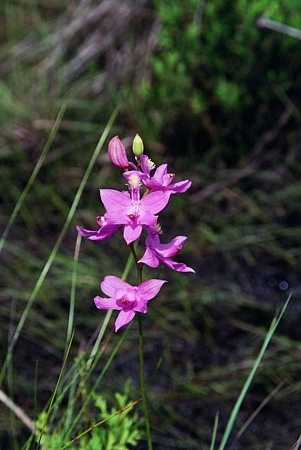 f.
Calopogon pulchellus R. Br. ex Ait. f. var. latifolius (St. John) Fern. Plant height: 4 - 20"
Foliage: pink to magenta with a yellow crested lip above the flower. Habitat: bogs or damp meadows with wet, acid soil; open sphagnum bogs. Usually one narrow, pointed leaf from base.